Instructions: Click here to view a larger photo of this project. Cut a piece of brown cardstock at 7 1/2 x 8 1/2" and score the 8 1/2" side at 7 1/2" and 7 3/4". Now glue the 7 1/2" part on the end of the 8 1/2"part, so you have a spine now of 1/4 inch. Now cut out the center a hole of 4 1/2 x 3" on both sides of the score lines. 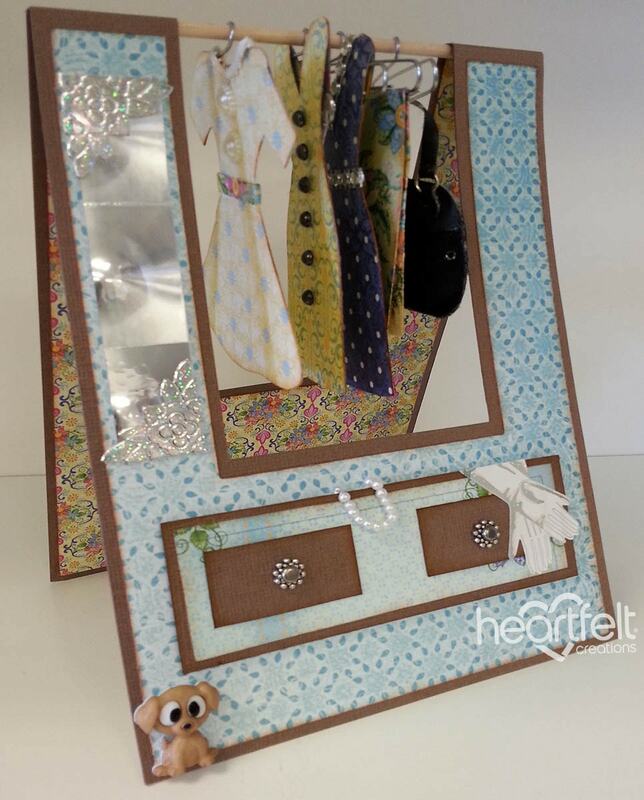 Take your Paper pad and take the papers you like and cover the inside and outside of the card. Cut a piece of the dowel so that it fits on the onside of the spine, glue it in the spine! Cut a piece of the Holographic cardstock of 3/4 x 3 3/4" this if for the mirror, glue this on the left side of the card and decorate it with some corner stickers. Cut a piece of the Brown cardstock at 4 1/2 x 1 1/2" and put 3D foam pads behind it now stick this on the bottom part of the card like a drawer, put designer paper and glue this on top of it, cut 2 pieces of brown cardstock at 1 1/2 x 3/4" and make a hole in the center get a brad and a spacer and place them in that hole fold out the brad and stick them down on the drawer. Get a piece of wire and put some beads on it close it and hang it out of the drawer, you can do that also with some Gloves (stickers). Take the Dog (button) and glue this on the left bottom corner. Take 5 paper clips and shape them into a clothes hanger, make some dresses of pattern paper and decorate them and hang them on the clothes hangers in the closet. I will place the templates for the dresses and Clothes hanger on my Blog.